“This triple dose of Carter Brown mysteries from 1957 finds homicide detective Al Wheeler investigating the deaths of two call girls, tracing a missing girl, and taking a job as a private investigator to clear a lawyer of a murder rap. 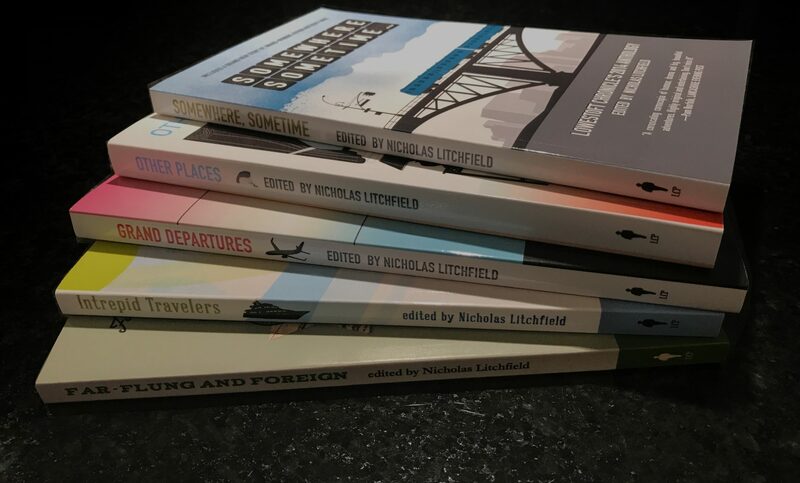 Nicholas Litchfield’s review of the third volume of Carter Brown novels to be reissued by Stark House Press is featured today in the Lancashire Post and syndicated to 20 UK newspapers. You can read the review here. “Absurdist humour and existential noir intermingle in Joseph Scapellato’s playful and intelligent debut novel about a soul-searching archaeology school dropout who finds himself at the centre of a strange and risky performance art project in the Czech Republic. Nicholas Litchfield’s review of Joseph Scapellato’s notable debut novel, The Made-Up Man, is featured today in the Lancashire Post and syndicated to 20 UK newspapers. You can read the review here. “Singled out by Edgar and Anthony Award-winning biographer Marvin Lachman as worthy of rediscovery, these two forgotten novels are reprinted this month in a Stark House combined edition. The first story, initially published in 1956 in Mercury mystery book magazine as ‘Keep an Eye on the Body’ and serialised in newspapers, was expanded and published by Harper & Brothers in January 1957 under the title Lead With Your Left. Engrossing and action-packed, it features a very ‘cocky’ 21-year-old New York police detective named David Wintino who is assigned a homicide case involving a retired policeman shot dead in an alleyway while working as a messenger for a brokerage house. The second novel, The Best That Ever Did It, published by Harper & Brothers in March 1955 as part of their hardback suspense series, is a lively, fascinating tale about a private eye’s investigation into the apparently motiveless killing of a contest winner and a police detective outside a dive bar in New York City. Again, Lacy presents a three-dimensional, sympathetic narrator who strays from the norm… this time, Barney Harris, a big, tough, 18-stone car mechanic who moonlights as a private investigator. Nicholas Litchfield’s review of these two exceptional mysteries from Ed Lacy is featured today in the Lancashire Post and syndicated to 20 UK newspapers. You can read the review here. “Born Julia Clara Catherine Dolores Robbins, prolific American novelist and playwright Dolores Hitchens began her career as a hospital nurse, and then a teacher, before becoming a successful professional writer. From 1938 until her death in 1973, she published forty books, utilising four nom-de-plumes. Her suspense novel The Watcher was adapted for the television series Thriller in 1960, and Jean-Luc Godard adapted her novel Fool’s Gold into the 1964 film Band of Outsiders. End of the Line, first published by Doubleday in 1957 and newly reprinted as a mass market Black Gat Books edition from Stark House, is the third in a series of five novels she co-wrote with her second husband, Hubert Allen ‘Bert’ Hitchens, who was a railroad investigating officer. All the books in the series feature the special agents of a railroad’s Los Angeles division, including regular character John Farrel, a veteran detective with an alcohol problem. Here, the wizened Farrel, a down-at-heel boozehound who lives in a boarding house, is teamed up with the inexperienced but enthusiastic investigator Calvin Saunders, an athletic, fastidious young man who drives a Chevy convertible. Former railroad bull (guard), now department chief, Ryerson, ‘a bear of a man,’ wants the pair to re-examine the Lobo Tunnel wreck, an unsolved case that resulted in sixteen deaths. Nicholas Litchfield’s review of End of the Line, an exciting mystery from Bert and Dolores Hitchens, is featured today in the Lancashire Post. You can read the review here. First published by Random House in 1950, So Many Doors is the debut novel by Pulitzer Prize-nominated American writer Oakley Hall, an English professor emeritus at UC Irvine and author of 25 books, who died in 2008. During his distinguished career, Hall won numerous awards, including the Wrangler Award and the Western Writers of America (WWA) Spur Award for his magazine pieces. His western novel Warlock, a finalist for the 1958 Pulitzer Prize, was made into a film by Twentieth Century-Fox starring Henry Fonda and Anthony Quinn, and his 1963 book, The Downhill Racers, was later filmed by Paramount as Downhill Racer starring Robert Redford and Gene Hackman. This newly reissued crime novel, which he wrote while studying at Columbia University, was initially overlooked when it came out in hardback, but the paperback went on to become a big seller and received wide critical acclaim. Set in the years following the Great Depression, it is an affecting, murderous tale about two inseparable lovers, consumed with overwhelming desire and corrupting jealousy, and the havoc their relationship causes to those around them. Divided into five sections, each told from the viewpoint of a friend or relative who interacted with the pair, the story spans a period of ten years, beginning in the early 1940s. Prolific author Matthew P. Mayo, who often focuses on the American West and New England, has written more than two-dozen books in the past ten years. Arguably, he is at the height of his career and writing his best work to date. Earlier this year, he won the Spur Award, the Peacemaker Award, and the Wrangler Award for his historical novel Stranded, and his Roamer Western, Timberline, and Blood and Ashes, book two in The Outfit series, received glowing reviews in Booklist, the Lancashire Post and other periodicals. A frequent contributor to anthologies of fiction, Mayo’s stories and essays are especially worth seeking out – his recent work can be found in The Trading Post & Other Frontier Stories (Five Star) and Invigorating Passages (Lowestoft Chronicle), both published in 2018. His newest novel, The Outfit: Outlawed!, the third installment in his lively, all-action adventure series set in the Old West, features an eclectic band of benevolent gunslingers led by former war hero-turned-spy Rafe Barr. Bullets zing, blades clang, and heads roll as tarnished heroes and desperadoes converge on the Governor’s mansion and Yuma Territorial Prison, setting up an explosive, thrilling showdown. Fun and fiercely entertaining, Mayo keeps the story moving along at a good clip, and the scene-stealing presence of the depraved head-chopper assassin Mincher helps ensure that this compelling third adventure is the best of the series thus far. Let’s hope that Rafe, ‘Sleuthing’ Sue, Cookie ‘Dynamite’ McGee and the rest of the rapidly expanding gang ride again soon. In this especially bruising tale, which sees him looking like a mangled, ‘battered-up prize fighter,’ Inspector Giddings believes Lam has taken the full count. But Lam, a glutton for punishment, is never one to throw in the towel, no matter how tough the opposition. My review of The Count of 9 is featured today in the Lancashire Post and syndicated to 20 newspapers in the UK. The full review can be found at the web link below and elsewhere. In this follow-up, Canadian detective Frank Yakabuski is caught in the middle of a violent gang war while investigating the grisly murder of a notorious gang leader found hanging from a fence in a kids’ sports field with his eyes cut out and a diamond worth 1.2 million dollars in his mouth. Drawing heavily on his experiences and travels as a journalist, Corbett enlivens the story with vivid descriptions of the wild, forbidding landscape and the volatile, warring inhabitants who dwell there, as well as cleverly weaving together numerous narrative threads. My review of Cape Diamond is featured today in the Lancashire Post and syndicated to 20 newspapers in the UK. The full review can be found at the web link below and elsewhere. Set in the summer of 1944, this is the thirteenth adventure for Boyle, the Boston detective turned U.S. Army investigator assigned sensitive WWII military investigations by his ‘uncle’ General Eisenhower. Here, he travels to a farmhouse near the town of Trévières in Normandy to investigate the murder of Major David Jerome, commanding officer of the Signals Company, Second Armored Division, who has been found with his throat cut in a chateau. Unfortunately, the crime scene offers up few clues and few witnesses, except for the ‘haunted, fragile, ethereal beauty’ Yvonne Virot, who discovered the dead body. Yvonne, whose dress is stained with Jerome’s blood, is a houseguest of wealthy widow Madame Regine Janvier, owner of the property and a former French Resistance agent. The trauma Yvonne has suffered at the hands of the Germans has resulted in her becoming mute, and so she can offer little to help Boyle’s investigation. Other figures in the small community are suspiciously tight-lipped and equally unhelpful, and by far the most dubious character of all is Claude Legrand, a liaison with the Resistance who is actively involved in killing and torturing suspected German collaborators. Feeling like he’s getting nowhere with his investigation, Boyle and his regular buddies, Staff Sergeant ‘Big Mike’ Miecznikowski and Lieutenant Piotr ‘Kaz’ Kazimierz, head out in search of the Second Armored Division and come across the uniquely gifted Ghost Army. As usual, Benn crafts a highly entertaining murder mystery, as well as eloquently reflecting on the horrors of war and bringing to light less discussed wartime incidents, such as the brutal punishment inflicted on women during the épuration légale (wild purge). My review of Solemn Graves is featured today in the Lancashire Post and syndicated to 20 newspapers in the UK. The full review can be found at the web link below and elsewhere.